Midgley United Reserves lifted the Halifax AFL’s Invitation Cup for the first time with a penalty shoot out win over Ryburn United Reserves at the Shay on Tuesday evening. Nick Farrar’s side won 3-1 on spot kicks after two hours of play had failed to split the Division One rivals with Ash Shaw’s early goal for Ryburn cancelled out by one from James Balmforth. Darren Nelson collected the trophy in the Ziggy’s Metro Cars-backed competition in his final game. 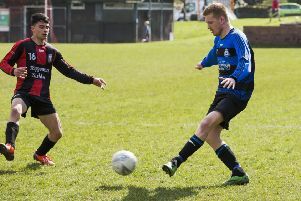 Midgley were hoping to make it a quick double at the same venue last night when their firsts played Warley Rangers in the Challenge Cup final (report at www.hebdenbridgetimes.co.uk and in next week’s paper). Favourites Ryburn Reserves went ahead inside five minutes. James Lawton getting behind the Midgley defence before squaring for Ash Shaw to tap home. Midgley were rattled but slowly got into the game with Balmforth looking a big threat and drew level on the half hour mark with a carbon copy of Ryburn’s goal. Jacob Shaw got round his marker wide on the right and sent in a super ball for Balmforth to side-foot home. Play swung from end to end with chances for both sides. The hard working James Yates and Sam Tattersall kept Midgley going forward and they found Balmforth a willing worker and a good outlet. Matty Hirst produced a fine save to keep out Balmforth’s volley in extra time while Lawton became more and more influential for Ryburn. Calum Wheelwright picked up a second yellow card leaving Midgley with 10 men for the last 15 minutes. In the penalty shoot out Ryburn missed three of their four attempts and Midgley wrapped up success by scoring from their first three. Ryburn Reserves: Matty Hirst, Kane Forbes, Jonny Mosey, Luke Kendall, Rob Worthington, Natty Powell, James Lawton, Jake Finch, Ash Shaw, Nathan Hargreaves, Lewis Brierley. Subs; Chris Wragg, Gaz Robertshaw, Craig Jennings, Rick Bottomley, Chris Redhead.